HockeyPucks hiking and highpointing: Storey Hill - 1025 Ft. / Wilkins Point - 1015 Ft.
Storey Hill - 1025 Ft. / Wilkins Point - 1015 Ft.
ELEVATION: 1025 Ft. / 1015 Ft.
From route 13 turn onto Meadow Rd. At 0.85 miles merge with McCollum Road and drive 0.2 miles turning left onto South Hill Rd. South Hill Rd deteriorates after 1.0 miles and becomes a class 6 road. I parked at a recently logged clearing however someone with a higher clearance vehicle could progress all the way to the actual trailhead. I parked at an open clearing on South Hill Rd where the road widens enough for a car to pull over cleanly. Continue South along South Hill Rd 0.4 miles to GPS coordinates N42 55.667, W71 48.568. There is an average sized rock cairn on the left next to a large diameter oak tree. The 400 Ft. Morrisette trail requires minimal navigational skills as it progresses to an old stone wall marking the boundary between New Boston and Mont Vernon and the Mont Vernon highpoint. I was very surprised to see a sign labeled "Wilkins Point - 1015 Ft." at the Mont Vernon highpoint. The summit is an additional 400 Ft. bushwhack to the north. The Storey Hill does not have any official markings however I found a small 3 rock cairn at what I considered the highest point. Wilkins Point trail - Wilkins Point = 400 Ft.
Wilkins Point - Storey Hill summit = 400 Ft. This hike was an unexpected pleasant surprise. 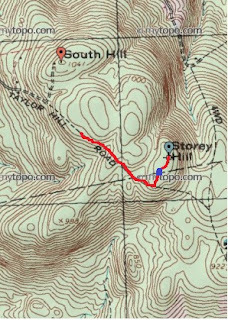 The Mont Vernon highpoint is along the contour line of Storey Hill and a few hundred feet from the actual summit. I didn't expect the highpoint or Storey Hill to be an exciting or memorable hike and I was excited to find a trailhead cairn, a trail leading directly to the marked Mont Vernon Highpoint. Research shows this trail is called the Morrisette Trail and begins at the lowest point in Mont Vernon called Zahn Point. The trail follows mostly roads to the trailhead cairn and the Wilkins Point 1015 Ft. highpoint. A cairn on S. Hill road marking the Morrissette trailhead. Federal Hill Fire Tower - 695 Ft.
Burns Hill - Milford NH - 751 Ft.
Mt. Madison - 5367 Ft.
South Hill - New Boston - 1041 Ft.
Joe English Hill - 1285 Ft. The Pinnacle - Hooksett NH - 485 Ft.
Pico Peak - 3957 Ft.
Camels Hump - 4083 Ft.